Trump announced the decision to move the embassy from Tel Aviv to Jerusalem in December, when he formally recognised the holy city as the capital of Israel, breaking away from decades of US neutrality on the sensitive issue. Jerusalem: The US today opened its embassy in Jerusalem under a controversial move by President Donald Trump, amid a bloodbath right on the border with Gaza where Israeli soldiers shot dead at least 41 Palestinians in clashes, in the deadliest escalation of violence since 2014. "Today, we officially opened the United States embassy in Jerusalem. Congratulations. It's been a long time coming," President Trump said in a pre-recorded video at the US embassy opening here. "Israel is a sovereign nation, with the right like any other sovereign nation, to designate its capital," he said. The American leader said the US remains fully committed to facilitating a lasting peace agreement between Israel and Palestinians. He said that his country supports status quo at the Temple Mount, a flashpoint of Israel-Palestinian conflict that houses the Western Wall (holiest site for the Jews) and the al-Aqsa mosque - known as Haram al-Sharif. "This city and entire nation is a testament to the unbreakable spirit of the Jewish people," Trump emphasised. Later, the US President tweeted, "Big day for Israel. Congratulations!" Scores of Palestinians were killed and around 1,500 were wounded on Monday by Israeli troops in clashes on the Gaza border before the opening of the US embassy in Jerusalem. The Israeli Army said on Twitter that 35,000 Palestinians were demonstrating along the Gaza-Israel boundary. 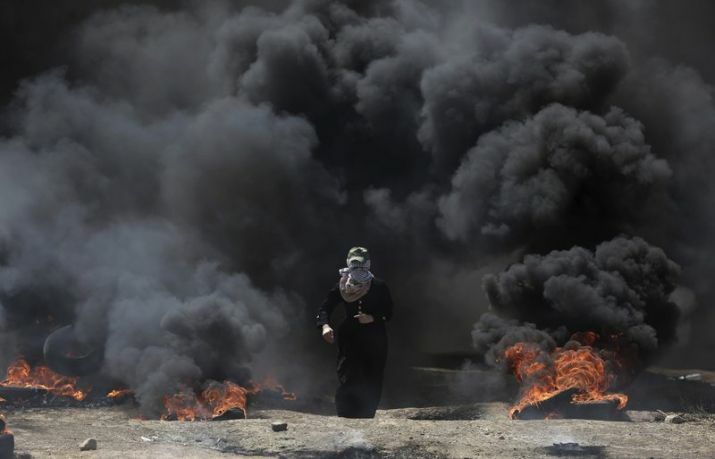 Among the deceased was a 14-year-old boy and reports from the Palestinian Health Ministry and the Red Crescent medical relief group said hundreds were suffering from gunshot wounds, while many others were hit by shrapnel or affected by smoke, the BBC reported. Witnesses said that several Palestinians managed to get through the security fence and that tens or hundreds were crossing into the Israeli territory. The demonstrations and general strikes had been planned to protest against the US embassy's relocation from Tel Aviv to Jerusalem, which many consider contravenes international consensus to not recognize the city as Israel's capital until its status is established during negotiations. The timing of the move has also been slammed, as it is being held a day ahead of Nakba Day ("Day of the Catastrophe"), which this year marks the 70th anniversary of Israel's creation and subsequent displacement of some 700,000 Palestinian refugees.